We offer several options to Key Stage 2 groups. The standard pattern for each visit is a 30 minute power point presentation followed by a 60-90 minute interactive tour of the Cathedral. A Diocesan planning guide is available before the visit and where there is a pre-visit or follow-up pack for teachers with suggestions for related classroom activities, it will be sent to you, by email, free of charge. The power point presentation covers a typical day in the life of the Cathedral, and includes a look behind the scenes of a working cathedral. The tour includes a look at the stained glass, the architectural features of the building, the bishop's throne and the story of St. Frideswide (patron saint of Oxford). This option is particularly relevant for groups studying Places of Worship. For this option, you will be sent a short story about a visit to the shrine of St Frideswide in the Middle Ages to read in class before your visit. On the day, there will be an introductory presentation about the monastery and medieval pilgrimage. Next, the children may dress up as medieval pilgrims (costumes provided) and make a pilgrimage to the shrine. 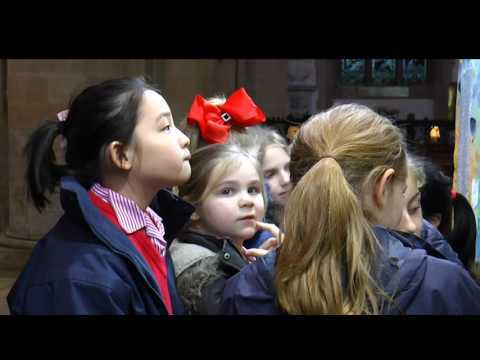 The children will have the opportunity to act out the story of Saint Frideswide and then enjoy a brief guided tour of the remaining medieval parts and key features of the Cathedral. This visit is aimed at the upper end of Key Stage 2. The introductory presentation takes a look at Cardinal Wolsey and Henry VIII, and their influence on the development of Christ Church. The children will learn about the events that led to the Reformation and the Church of England. The children will also learn about the differences between the Protestant and Catholic Churches in the Reformation. Finally, there will be a tour of the Cathedral looking at the signs of the Reformation that can still be seen today. This option offers pupils the chance to learn about some of the famous Victorians associated with the Cathedral, such as Edward Burne-Jones, Gilbert Scott, William Wilberforce and Lewis Carroll, a tutor at Christ Church, who wrote the children's classic, 'Alice in Wonderland', inspired by Alice Liddell, the Dean's daughter. Your visit will start with a presentation, about the Cathedral in Victorian times, followed by a tour of the Victorian features and places at Christ Church. Option 5: Who is the Christ of Christ Church? This option offers pupils the opportunity to learn more about the life, teachings and influence of Jesus. Who was he? Why has his influence lasted so long? What can we learn about him from the Cathedral? How does it tell his story and give him glory? The presentation and interactive tour will introduce and reflect the most important and relevant Christian concepts and festivals. Children, in Saxon dress, may find out more about St Frideswide’s influence and Saxon life in the place where Oxford was founded. Children dress up as medieval monks and find out more about monastic life, past and present. Charles 1st lived at Christ Church during the Civil War and there is much to discover about Oxford life in those troubled times. 'Thank you for the fabulous day …. It was so informative, so educational and such fun. We could not have asked for more. I would like you to know that for the first time I have received an email from ALL the parents thanking us for such a great day.' (Year 3 teacher, Oxfordshire). Please apply to visit at least four weeks in advance. Once booked, you are welcome to arrange a half-hour pre-visit, before you bring your class. There is no charge for this visit. There is unfortunately no parking at Christ Church, but it is possible to drop off pupils outside the College. The nearest place for coaches to park is the local Park and Ride.